Apple on Wednesday updated its dedicated Apple Watch website to include additional information on operating system features unique to the wearable device, including break-out categories covering health and fitness, timekeeping and messaging. Partly a reshuffling of existing information previously lumped together in "Overview" and "Features" subcategories, the refreshed Apple Watch site does offer a glimpse at the device's user interface as well as examples of how Apple intends customers to use the device. One section under the Timekeeping banner highlights so-called "complications," a term Apple borrowed from the watchmaking world to describe a specialized set of user-activated sub-features that appear on select watch faces. For example, users can customize their watch to display weather readings, daily activity and stocks in subgroups positioned around a central analog or digital clock readout. Tapping on a given complication opens the corresponding app from which data is being pulled. The complication feature was previously shown off during an onstage demonstration conducted by Apple Vice President of Technology Kevin Lynch at the Apple Watch unveiling in September. 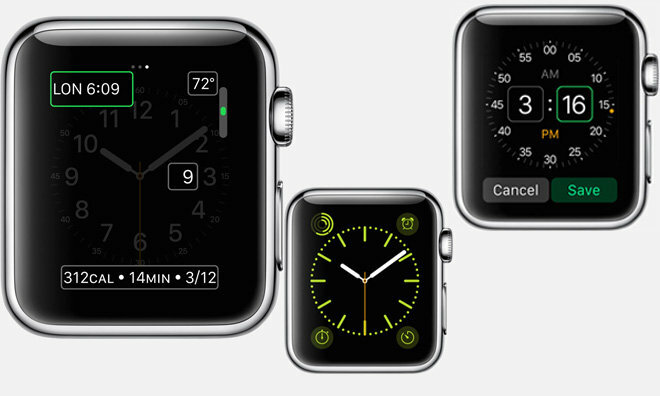 Also in the Timekeeping section is a grid of available watch faces and their respective descriptions. 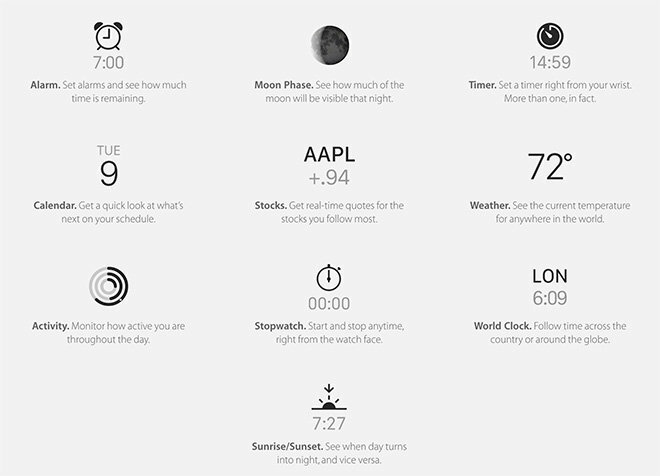 Prior to the webpage's update, Apple showed off each face in a graphic, but failed to go into detail about how each worked. As for Apple Watch communications, Apple now includes animated demonstrations of Sketch, the image-based messaging tool that allows users to send simple doodles to each other by drawing directly on the watch face. The site also shows off Tap, which serves as a silent form of communication based on haptic alerts, as well as a unique Heartbeat feature that uses Apple Watch's onboard heart rate sensor to transfers readings as vibrations set to a pulsing heart illustration. Other animations include texting and phone call management. 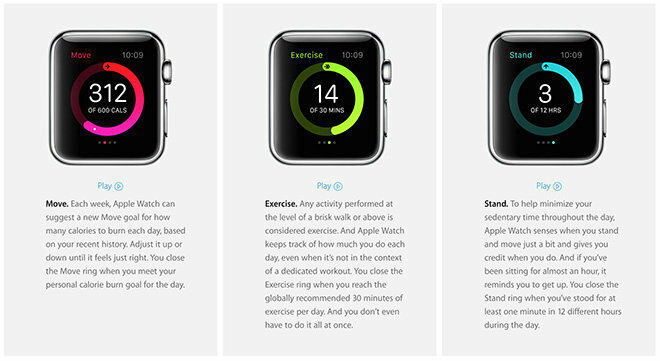 Finally, Apple highlights Apple Watch health and fitness capabilities with in-depth detail on pedometer functions, movement tracking, data logging and syncing with a host iOS device. Animations are included for the built-in activity app's Move, Exercise and Stand graphical user interface that represents accumulated metrics by filling up gauges shaped like rings. Apple Watch is expected to launch in early 2015, though a definitive date has not yet been set.